"Loneliness has followed me my whole life, everywhere. In bars, in cars, sidewalks, stores, everywhere. There's no escape. I'm God's lonely man"
I remember the first time I ever saw Taxi Driver. I was sixteen years old, on my first foreign holiday with a couple of mates – in Benidorm, of all places. It was early afternoon. We were in some bar, already half drunk. The place was quite cool. There was Indie music playing from the speakers and wall-mounted television screens played scenes of De Niro in his most famous roles on a repeating loop. After a while, I noticed the images on the televisions had changed, and there was a movie playing. I’d never seen it before. 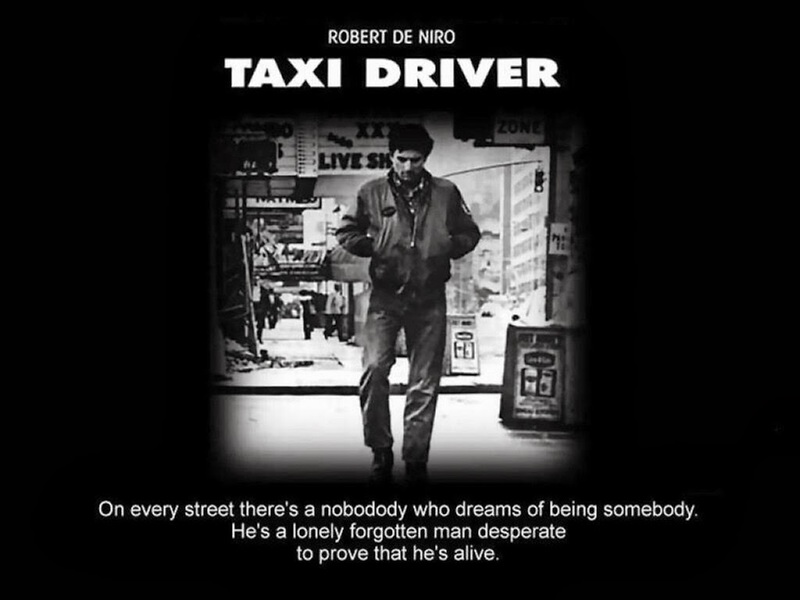 It featured Robert De Niro driving a yellow cab through a mythical, mist-shrouded NYC. My mates wanted to move on to another bar but I wanted to stay. So they left me there. I watched the film through, with no sound. Then I watched it again because I wanted to see what it was. When I got home from holiday I rented it on VHS. Then I rented it every weekend. Since that day, Taxi Driver has been my favourite film. To me, it’s flawless. I heard a story that Martin Scorsese and Paul Schrader where in such a weird place when they made the film that, afterwards, when he saw the final cut, Scorsese got nervous. He didn’t want to be responsible for releasing a film that was so perfect. So he scratched a single frame of the negative, to take away any risk of that responsibility. Schrader was living out of his car when he wrote the screenplay, with a gun in the glove compartment. He was going through a tough divorce. His mind was crumbling. You can tell that from the film. He and Scorsese created something incendiary. It’s terrifying and funny and tender and brutal and genuinely unnerving. It’s an insane film; it’s psychotic. Great entry Gary, I share your love of this film, though Mean Streets and Blue Collar come a close second. Really well written and it's made me want to go and dig out my old copy.